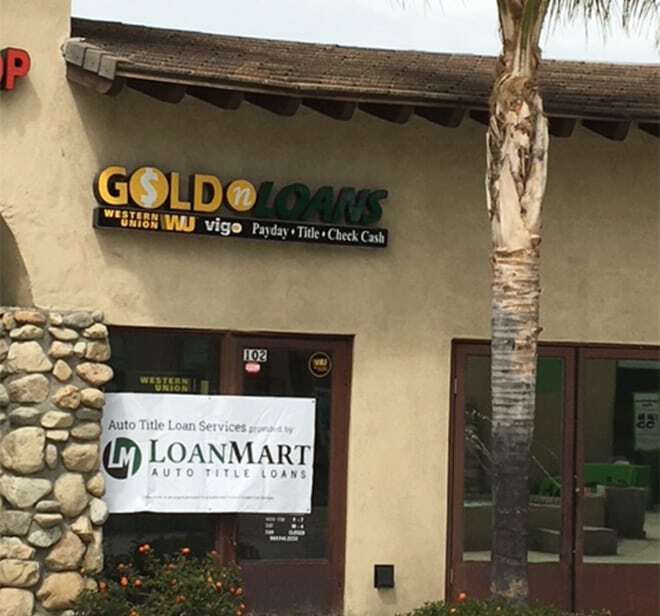 This Gold N Loans is at the intersection of E Foothill Blvd and Vineyard Ave.
OmniTrans bus line #66 has a stop in front of this location at Foothill @ Vineyard WbFs. Check their website for more details. This Gold N Loans neighbors Jack in the Boc, In-N-Out Burger, Klatch Coffee, and Albertsons. Here’s how it works: using your free-and-clear vehicle title as collateral, you may be able to borrow the money you need now, and have anywhere from 12 to 48 months to complete a series of affordable monthly payments. It’s also completely free to apply for Rancho Cucamonga resident. Keep reading to find out more about how LoanMart may be able to help you get back on track. Traditional lenders often reject those who have poor credit. Unlike traditional lenders, LoanMart encourages customers with any credit type to apply for auto title loans in Rancho Cucamonga. LoanMart will look at multiple qualifying factors other than credit, including your ability to make consistent monthly payments as well as your vehicle’s equity. Collect your money in as little as one business day after qualifying3! Just call toll-free number to apply over the phone. Stuck at work? You can submit an information request form online using your computer, smart device, or tablet. Once approved, your rep will talk to you about the auto title loan retrieval process, via 800LoanMart and Gold N Loans!